The demand for corporate social responsibility has never been higher. The impact CSR can make on your consumer brand and employer brand is tremendous. Take a look at some of the latest research proving the impact of CSR. The benefits to being a socially responsible company continue to grow, but as they do, so do the threats to CSR. We’ve outlined the biggest threats to CSR impact in 2018, as well as what companies can do to stay ahead of them. The standard deduction is increasing = meaning fewer people will itemize their taxes. Less people benefiting from the deduction means less donations to charity. Did You Know? The Tax Policy Center estimates charitable giving will be reduced anywhere from $12.3 billion to $19.7 billion in 2018, a 4 to 6.5% decline in giving. What is the impact of #CSR on your consumer and employer brand? Take a look:Tweet This! So what will it be? Will giving go up or down? Well, it could go either way! More money back up front might balance out the deduction changes and giving could potentially increase. In addition, the corporate tax rates have been slashed by 14%, giving employers more money to boost their corporate giving programs (think more matching gifts, or increased incentives to participate). With your 14% reduction in taxes, invest the money back into your employees’ salaries, invest more money into your corporate philanthropy programs (matching gifts, volunteering paid time off, etc) and reward employees monetarily for their participation. Using a portion of your tax benefits to stimulate your corporate philanthropy programs is a must to tackle the decline in charitable giving we could see from private donors because of changes to the standard deduction rate. How Corporations Can Help: According to Harvard Business Review, businesses are expected to invest more than $93 billion in cyber defenses by 2018. Implement a secure system to handle all of your corporate giving transactions. CyberGrants Disbursements System completely protects your company by transferring liability to a 3rd party. 74% of finance professionals report that their organizations were targets of payments fraud in 2016; checks continue to be the payment method most exposed to fraudulent activity. Nearly half of all survey respondents reported that incidents of fraud attempts increased in 2016. According to FBI estimates, losses from check fraud total $18.7 billion annually. How Corporations Can Help: Invest in a system that proactively protects your company, employees and nonprofits from fraud. CyberGrants Disbursements System takes responsibility for vetting all organizations to protect against fraud and immediately transfer funds to negate escheatment concerns. At CyberGrants our mission is to provide innovative software and services in the most secure and efficient way. How do we do this? By constantly evaluating technologies, regulations, processes and partnerships. Continued changes in regulations related to disbursements have driven an evolution of the distribution alternatives offered to our clients. These regulations have increased the markets focus on issues of risk and liability. Increase efficiency in administration of gifts? Aggregate payments for simpler management? Simplify your tax receipt process? Find a partner focused on changing risks? Our banking partners are increasingly focused on managing the changing risks associated with financial crimes and we are all determined to strengthen our Anti-Money Laundering (AML), Economic Sanctions and Customer Due Diligence (CDD) program requirements. Plus any enhanced measures are intended to comply with evolving Know Your Customers guidelines and new regulations issued by the U.S. Treasury Department’s Financial Crimes Enforcement Network (FinCEN) and ensure sound money transfer practices. To meet these challenges, CyberGrants is now offering three banking and disbursement options that provide great benefit to donors, nonprofit organizations, and our corporate clients alike. To explore these options more download our brochure. 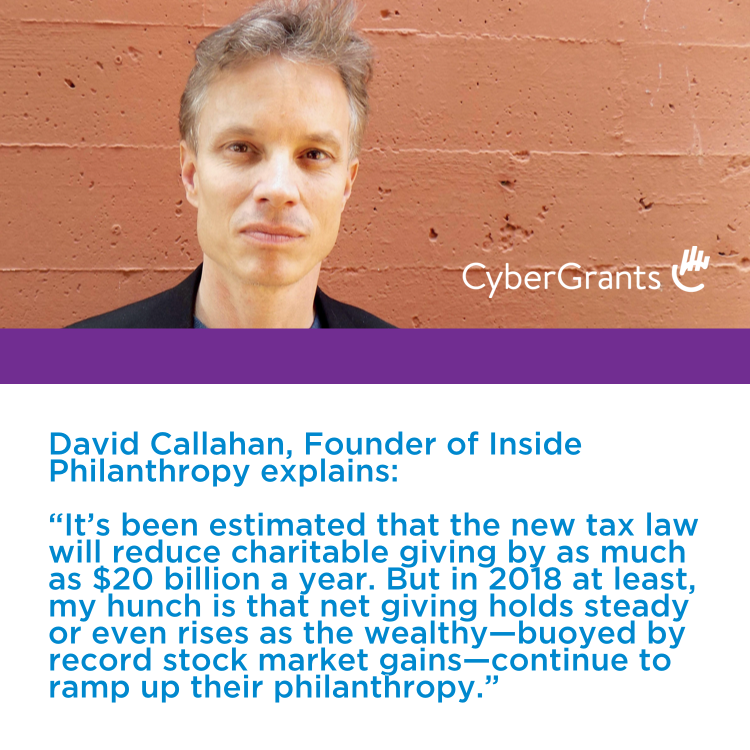 Speak with an expert at CyberGrants to see how our secure platform can keep your corporate philanthropy initiatives protected this year.